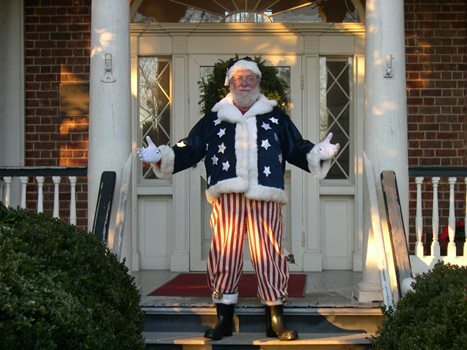 Santa will be at Historic Sandusky for its 11th annual Christmas Open House from 1 to 5 p.m. on Saturday, December 13. Santa Claus will read ’Twas the Night Before Christmas at 2 p.m. There will be house tours, music, refreshments and a craft program for children to make and take home. Entry is free. LC students Kathy Brisentine, Diana Spangler and Kelly Childress are interns at Historic Sandusky and have put the program together. Historic Sandusky is located at 757 Sandusky Drive in Lynchburg and is a registered Virginia Historic Landmark and is listed on the National Register of Historic Places. The house is one of the finest examples of Federal style architecture in Virginia’s Piedmont region and is on the Civil War Trails tour. A partnership between University of Lynchburg and Historic Sandusky was announced in December 2011. For more information contact Greg Starbuck at 434.832.0162.